I have been considering answering your request for a motion picture autobiography ever since the May 26th Picturegoer fell into my grasping hands a week ago, until I could not resist the urge this morning and refused to be tempted by the thoughts of a luxury lay-in or even ‘mon petit dejeuner’, so please spare me the cruel information that you are accepting no more contributions as I could not bear the thought of so much wasted energy. My interest in films was first awakened, when I was expected to accompany my elder brothers and sisters to the nearest cinema perched on a hill some two miles distant, so that my parents were free to choose their particular choice of entertainment on Saturday afternoons. We were ‘treated’ to the front stalls but even on Saturday pennies did not always provide sufficient odd cash to travel in style so the hike not only enforced an early start, but also a delayed return. My superiors would converse very learnedly on the way about the respective merits of the film we were about to see and it always used to puzzle me how they knew so much about it when they had not even seen it. Tarzan was a great favourite of mine in those days although even then my fellow hero-worshippers were inclined to be slightly cynical as well as highly intrigued by his magnificent feats. I must have reached the imposing age of eight years or thereabouts when I considered Alice in Wonderland a film worthy of a three hours’ wait in the pouring rain at the aforementioned cinema partly because I had had visions beforehand of myself playing the part of the heroine. These were inspired by my mother’s insistence that I was the image of the ‘real Alice’ for whom the studio was searching, but my photo only resulted in a letter of thanks, the news that the part had been allotted to Charlotte Henry and the rapid subsidence of my dreams of fame. These have never returned to the same extent since I have realised that magnificent swimming pools, publicity and glamour do not necessarily make for happiness, although there are times when I envy the stars the projection of their personalities on the world at large. There is a spark of vanity in most of us which is encouraged by being the centre of attraction in some sphere however small and it must be wonderful to know that strangers too are aware of that irrepressible charm. The disadvantage however is that people are apt to think of their screen heroes and heroines only in terms of their screen personalities instead of men and women with the ordinary trials of life plus those of their unreal environment to face. It is mainly because of this that I am satisfied with my obscurity in the work I have chosen and have no great desire to change places with the hard working people in the entertainment world. I always used to imagine that Hollywood hair styles, clothes and make-up were well out of my reach, but since the advent of natural beauty has arrived, it has become apparent to me that the rest are only appendages to produce the desired effect. Ingrid Bergman is far more truly glamourous [sic] than Ginger Rogers in all her films, in Lady in the Dark while Ginger herself has no need to rely on the artificial props. Studios tend to bring out a sparkling new star and rely on his or her talents from the start, but then gradually fit those same distinguishing features into the old pattern, thus forming an entirely new, less exciting personality. The screen world always appeared as a dream world and although it has given me the desire to travel it has not made me feel dissatisfied with my way of life. Travel films, pictorial, nature study, documentaries all interest me as they have something to teach, while films made from books encourage my love of literature. My time is obviously running short with the result that my reply is conforming to the conventional pattern set by the lecturer for ‘guidance’ only, which may have prevented many irrelevancies if they had been consulted earlier and provided more of the required information. Nevertheless I intend to conclude this autobiography which more rightly belongs to the readers column, with the information that films have given me vocational ambitions to become a soldier, lawyer or nurse etc: to be more precise The Lamp Still Burns was mainly responsible for my taking up student nursing at this hospital and I can only thank all the people concerned in the production for their moving portrayal of the characters, which so greatly influenced my decision. Comments: J.P. (Jacob Peter) Mayer was a German sociologist at the London School of Economics. His British Cinemas and their Audiences collates motion picture autobiographies submitted through competitions in Picturegoer magazine. This contribution comes from the section ‘Films and the Pattern of Life’. 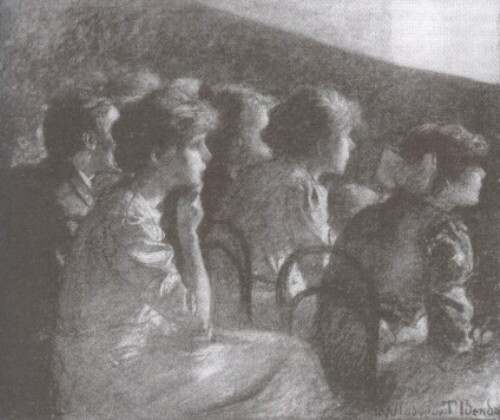 Contributors were asked to trace the history of their interest in films, the influence films had on them (including if they were ever frightened by films), what they imitated from films, if films made them more receptive to love-making, if films made them want to travel or to be dissatisfied with their way of life or neighbourhood, and if films gave them vocational ambitions. The films mentioned are Alice in Wonderland (USA 1933), Lady in the Dark (USA 1944) and The Lamp Still Burns (UK 1943). This entry was posted in 1930s, 1940s, Reports and studies, United Kingdom and tagged Alice in Wonderland (1933), Cinemas, Documentary and non-fiction, Lady in the Dark (1944), Literary adaptations, Nature, Performers, Prices, Queues, Seating, The Lamp Still Burns (1943), Travelogues. Bookmark the permalink.